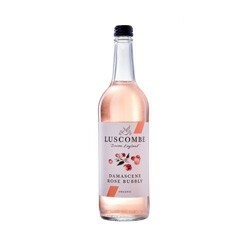 With its elegant flavour and delicate fizz, this organic rose bubbly from Luscombe offers a serious alternative to Champagne for discerning non-drinkers. A 2016 Great Taste Awards winner, it is made with real Damascene roses, Muscat grapes, Sicilian lemons – and no added sugar. You can enjoy it any time - a chilled glass of blushing pink bubbly always feels like a special occasion – but it is at its loveliest when served at a party alongside canapés, or light seafood dishes such as scallops. Luscombe have been making juices in small hand-made batches since 1975 within the historic setting of the Domesday Farm at Buckfastleigh in South Devon. Their drinks are made using only the finest quality fresh ingredients.